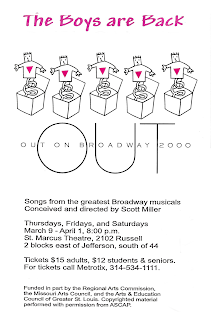 When we put together the first Out on Broadway in March 1996, we had no idea that there would be such enormous public demand for more performances that we’d have to bring it back in August of that same year. We never thought there’d be a cast album. And we certainly never thought we’d be doing a sequel four years later. So much has changed since 1996. Will and Grace is on television every week, getting great ratings, and three more shows with gay lead characters are planned for next season. And for good or bad, gay Americans are every bit as visible as straight Americans on Jerry Springer and the other talk shows. Gay marriage has become one of the top issues in the country, with the Vermont Supreme Court ordering the state legislature to give gay couples equal rights, with Californians voting on a referendum against equal marriage rights for gay couples on March 7, and with the Hawaii gay marriage case still rumbling despite setbacks. In contrast, a study just released says 2.5 million gay Americans are currently in heterosexual marriages. The issue of adoption for gay couples is coming before courts around the country. Anti-gay discrimination in groups like the Boy Scouts is being actively challenged in the courts, and in some cases, is being condemned. As the presidential races heat up, gay issues are on the agenda everywhere you look. Both Al Gore and Bill Bradley are actively courting gay voters. And even the most conservative Republicans are being forced to acknowledge us and address our issues. And yet, Matthew Shepard was brutally murdered in Wyoming just for being gay. Billy Jack Gaither was murdered in Georgia for the same reason. And they’re not the only ones. 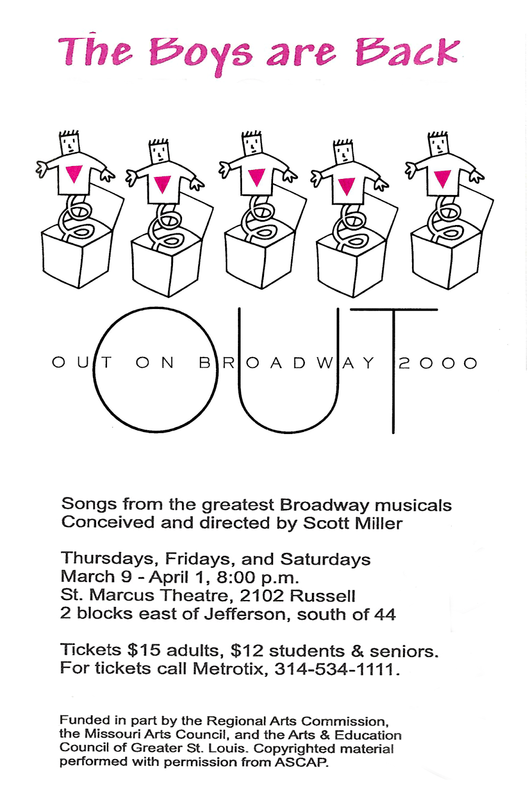 One of the purposes of the original Out on Broadway was to tell gay teens and closeted gay men and women that it’s okay to be gay, that they can be gay and still be proud of who they are, that being gay is not a sickness. With all the increased visibility for gay Americans, perhaps that’s not as necessary today as it was four years ago. The other purpose of the original show was to demonstrate how alike gay and straight people are, and how alike gay and straight love is. That is still necessary because, even though we are all alike deep down, the world still does not treat us alike. It’s amazing how easy it was for most of these songs, originally written for straight characters, to work in a gay context – but they do, precisely because gay people think and feel most of the same things as their straight friends and families. And that message can’t be spread far enough or fast enough. So enjoy the show. Laugh along with us, cry along with us, but most importantly, remember that we are your brothers and sisters, parents, friends, neighbors, and co-workers. Remember that many of us want to marry. Some of us want to have kids. And all of us want the respect we deserve.